Disclosure: I received 3 Peanut books for feature from Regnery Kids. All opinions are my own. Kenzie and Mason both love books so I am always delighted when the receive such as gifts. I once requested only books as gifts for Kenzie's 2nd birthday. She wasn't so appreciate at that time but mama knows best, as usual. Regnery Kids publishes fun and creative children's literature that take children on an adventure. 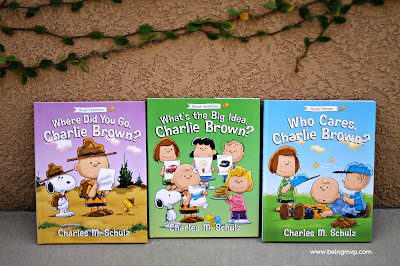 Kenzie will be excited to see the trio of Peanuts books as she knows of the gang due to her visits at Knott's Berry Farm. The books are light and easy to read and are illustrated beautifully. "Who Cares, Charlie Brown?" by Charles M. Schulz. This touching ode to some of the world’s great humanitarian heroes will warm hearts and inspire. "What's the Big Idea, Charlie Brown?" by Charles M. Schulz. Rediscover history’s great invention and learn about a very important inventor. "Where Did You Go, Charlie Brown?" by Charles M. Schulz. Retrace the remarkable journeys of men and women who tread new ground. "From Sea to Shining Sea" by Callista Gingrich. The fourth book in the New York Times bestselling Ellis the Elephant series takes Ellis west into uncharted territory with Lewis and Clark. Along the way, Ellis learns about the two explorers’ epic journey and the amazing discoveries and innovation it sparked. "Freddy the Frogcaster and the Big Blizzard" by Janice Dean. The author is a Fox News weather personality. Freddy the Frog loves learning about the weather, and he’s known for having the best predictions in town. But what happens when a blizzard rolls in? "Awesome Possum Family Band" by Jimmy Osmond. Osmond fans—both old and new—will treasure the book's timeless message and nostalgic nod to one of America’s most famous music-making families. Includes pictures of the actual Osmond family members ranging from Father George to Osmond Child Number Nine, Jimmy. "The Night Santa Got Lost: How NORAD Saved Christmas" by Michael Keane. Every Christmas millions of kids and adults track Santa on the NORAD Santa Tracker. Now, author Michael Keane brings to life this fun tradition with his new children’s book. Families with someone serving in the military overseas will find this book especially meaningful. "The Best Part of the Day" Sarah Ban Breathnach. Beautifully illustrated and lyrically written, this “good night” story (by the author of the international bestseller, Simple Abundance, that inspired millions of women to find happiness in each day of their lives) encourages children to find at least one moment in every day that is worthy of celebration. The Best Part of the Day is the perfect addition to any family’s nighttime routine. Do your children like books as gifts? Do you enjoy gifting books during the holidays? I would choose.What’s the Big Idea, Charlie Brown? For my favorite niece. I would love I Believe in Genevieve for my niece! I think I'd pick The Best Part of the Day for dd! 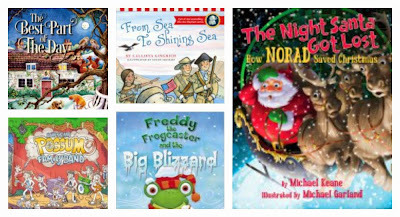 My daughter would like Freddy the Frogcaster and the Big Blizzard by Janice Dean. She loves frogs and would get a kick out of a frog in a blizzard. I like the book, yanky doodle dandy! I would like Freddy the Frogcaster and the Big Blizzard for my nephew. I'd pick the Night Santa Got Lost for my son. My kids would love the night santa got lost book! The Remarkable Ronald Reagan for my daughter. I'd like The Best Part of the Day for my niece. The Night Santa Got Lost: How NORAD Saved Christmas for my kids. I would choose The Night Santa Got Lost: How NORAD Saved Christmas, my kids would love it! I would choose Freddy the Frogcaster and the Big Blizzard for my little girl! by Janice Dean for my youngest son! I'd like to have The Best Part of the Day for our granddaughter. I would get the Yankee Doodle Dandy book for my granddaughter who is a real firecracker - born on the 4th of July!